Movado is best known for their legendary Museum watch, whose purist design with a dot at 12 o'clock is famous the world over. However, the manufacturer's portfolio also includes chronographs and classic models with rectangular cases. Time is not just a series of numbers to the Swiss watch manufacturer Movado: To them, it's about the relationship between the Sun and the rotation of the Earth. Such thinking is perfectly encapsulated by the legendary, Bauhaus-inspired design of the Museum watch with its iconic dot at 12 o'clock representing the Sun at its zenith. Originally designed by industrial designer Nathan George Horwitt in 1947, Horwitt commissioned Vacheron & Constantin Watches Inc. to produce three such pieces in the mid-1950s, one of which has been a part of New York’s Museum of Modern Art’s permanent collection since 1960. The design has also had a strong influence on every Movado collection since its controversial introduction to their catalog. Almost every model features this characteristic dot design, regardless of if its a chronograph or a two or three-hand watch. The Horwitt design is famed for its purist nature and its dial, which is completely blank but for a dot and two hands. There are no indices, numbers, or minute scales to distract from this model's clean look. The cases are also round and characterized by their eye-catching clean lines. Additionally, Movado offers models with a reinterpreted design for those who are looking for something a bit more exciting. For example, the Bold collection includes models studded with diamonds and others with Roman numerals. Most of the newer models are quartz powered, though Movado also produces mechanical timepieces. Automatic and manually wound movements are mostly found in older models. With a history dating back to 1881, there are plenty pre-owned Movado pieces on the market at great prices. Each piece's design is a reflection of its time. This makes Movado an interesting option for collectors. Vintage models from before the introduction of the famous dot are a real treat to look at. Their chronographs from the 1970s, such as the Datron HS360 with an El Primero movement, are especially interesting. There are also plenty of classic models reminiscent of the Cartier Tank available. How much do Movado watches cost? You can purchase a new, 39-mm Movado Museum with a dot at 12 o'clock, a stainless steel bracelet, and a quartz movement starting around 500 USD. 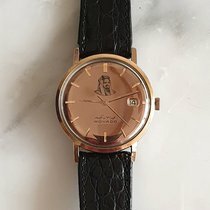 Women's watches in this style go for as little as 300 USD. If you prefer models without a dot, take a look at the pre-owned watch market, where you will discover a wide variety of vintage Movado watches in good condition from the 50s, 60s, and 70s. Having been launched before the introduction of the Museum dial, they feature designs more in line with other classic watches from these periods. You will come across round, pillow, and rectangle-shaped cases, each a reflection of their time. For example, some Kingmatic models have styles reminiscent of the Patek Philippe Calatrava. Prices for these pieces begin around 1,500 USD. Movado merged with Zenith in the late 1960s. The resulting partnership would lead to the world's first automatic chronograph caliber: the El Primero. Zenith and Movado weren't alone in their endeavor: Their competitors included Seiko as well as a collaboration effort made by Breitling, Heuer, Büren, and Dubois Dépraz. The Movado Datron HS360 chronograph includes this movement − one of the most prestigious chronograph movements of all time − making it a real insider's tip. Its subdials have a well-balanced tri-compax layout and are located at 3, 6, and 9 o'clock. This chronograph often comes with the popular black-on-white panda dial or the white-on-black reverse panda dial made famous by the Rolex Paul Newman Daytona. Its pillow-shaped barrel case couldn't be more 70s and comes in stainless steel with or without gold plating. Movado also made a diving version with a rotatable bezel, known as the Datron HS360 Sub Sea. 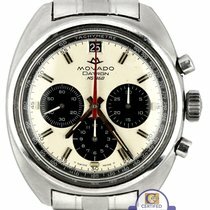 Plan to spend around 4,600 USD for an El Primero-powered Movado chronograph. The iconic dot at 12 o'clock, know as the 'dot dial design', can be found in many of the Swiss watch manufacturer's collections and has become something of a Movado hallmark. The Museum Classic line is mostly composed of pieces inspired by the original design with a solid black dial. Their cases range from 28 to 40 mm in diameter, and the color of the dot always matches that of the bezel. An empty dial with only a dot and two hands is characteristic of this design. However, there are also examples with mother-of-pearl dials and diamond indices. In terms of cases, you have a choice of plain stainless steel or stainless steel plated in yellow or rose gold. The bands come in similar options: stainless steel, bicolor, calf leather, and gold-plated bands are all available. Watches in this collection are equipped with quartz movements and have prices starting around 620 USD. If you're on the hunt for a more exciting interpretation of the Museum watch, look no further than the Movado Edge collection. Its dials are made of aluminum and have a three-dimensional design: The dot at 12 looks larger and almost seems to protrude from the rest of the watch. A series of waves runs around the dial's edge, symbolizing the rays of the sun. The Edge collection was designed in cooperation with Yves Béhar, a famous industrial designer. Its dials come in a number of refreshing colors and feel dynamic and modern. From purple to light blue and green and most everything in between, this line is second to none in terms of color variety. The Edge also comes as a chronograph with a tri-compax subdial layout. Two-hand quartz models go for as little as 620 USD, while a chronograph can cost around 1,200 USD. Fans of sporty designs and larger cases may enjoy the Bold collection. It includes models up to 48 mm in diameter. With its numerous design combinations, this series is diverse and comes across as a new version of the Museum design. From simple two-hand models to somewhat more lively chronographs and diamond embellishments, this line has it all. Be sure to set aside around 740 USD for a chronograph with a titanium case. The Movado Ermeto was introduced in 1926 with a rectangular, capsule-like case, which was opened by pulling the two halves in opposite directions. Originally outfitted with typical hand-wound calibers, an update only one year later allowed the caliber to be wound by opening and closing the case. Movado marketed Ermeto pocket watches as travel clocks and, fittingly, outfitted them with refined cases ranging from the classic to the extravagant. An Ermeto in very good condition with line indices and a crocodile leather case costs about 1,100 USD. Movado presented the 1881 Automatic at Baselworld 2015 in celebration of their founding year. These watches are powered by the ETA caliber 2824-2. This caliber, whose name comes from the eponymous Swiss movement manufacturer, is also used by many other famous brands, such as Omega and Tudor. Designed as a dress watch, the 1881 captivates with its modern elegance. While its design has a few different focal points, it doesn't feel cluttered: A date display sits at 6 o'clock atop the 'AUTOMATIC' and 'SWISS MOVADO MADE' inscriptions. In addition, a minute scale runs around the edge of the dial. Its dauphine hands combined with a lack of numerals underscore the clean elegance of this automatic watch. You can purchase a Movado 1881 Automatic starting at around 870 USD. With cases 24 mm in diameter and delicate, skeletonized bracelets, the Amorosa collection is geared toward women who prefer petit watches but still want to enjoy the Museum design. The stainless steel bracelet also comes in gold-plated and bicolor varieties. Some even feature diamonds. You can call one of these jewelry-like pieces your own for as little as 500 USD. The word Movado means 'movement' in Esperanto. This idea has been a part of the company's philosophy from the beginning: Since its foundation in 1881, the self-confident brand has been developing and reimagining their designs. From stylish vintage models to the simple and modern Museum watch: The name Movado stands for more than just timekeeping.